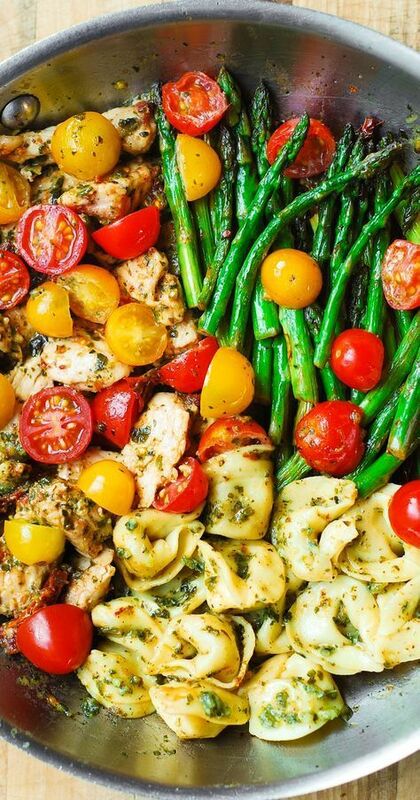 Pesto Chicken Tortellini and Veggies , By Melissa C. Klein | Healthy Dinner Recipes Easy . • In a large skillet heat 2 tablespoons olive oil on medium heat. • Add sliced chicken thighs (seasoned with salt), 1/4 cup of chopped sun-dried tomatoes and cook everything on medium heat for 5-10 minutes, turning chicken slices over a couple of times, until the chicken is completely cooked through. • Remove the chicken and the sun-dried from the skillet, leaving the oil in. • Add asparagus (ends trimmed), seasoned generously with salt, and 1/4 cup of sun-dried tomatoes to the same skillet.